Our team specialises in high quality WiFi installations for businesses and large residential properties throughout Sussex and Surrey. Our solutions are bespoke to your property and ensure high quality WiFi that’s fast and secure. At Woodstock IT we create a managed WiFi system so your business or home has an excellent WiFi connection throughout, meaning you can work, entertain and use the internet as you require without any issues. This includes streaming 4k HD content on multiple devices, using several apps at once and completing downloads without delay. We have a wide range of experience in a variety of properties and provide an initial consultation to quote on the works that will be required. Get in touch by calling us on 01403 290 321 or 01293 912 321 if you would like to improve, upgrade or refit the WiFi in your property. Our fully trained team also work on point to point Wireless solutions, where you can achieve a permanent wireless link between two buildings. All of our managed IT projects use hardware with proven performance that will be tailored to your current usage and future requirements. This reduces the risk of downtime on the network and guarantees energy efficiency throughout the system. Once connected, you’ll be able to make use of the WiFi indoors and out, within a feasible distance. After installation we will continue to monitor the speed and ensure the security software is always securing your personal data and online communications. This includes utilising a protected WiFi set-up and implementing a firewall to defeat any attacks. Depending on the scale of your set-up, we offer project management to minimise stress throughout large scale projects. This includes office buildings, substantial homes and estates. Managed WiFi in these instances requires a focus on data cabling and maintaining the quality of the connection over a wider span. Our point to point wireless service also allows you to have excellent WiFi across two buildings. This can be tailored so that unfeasible or undesirable physical cables are removed from the set-up without impacting the quality of WiFi received. Ideal for an annex, line of sight for these connections is up to 15km. If you have a question or want more information, we’d love to hear from you. 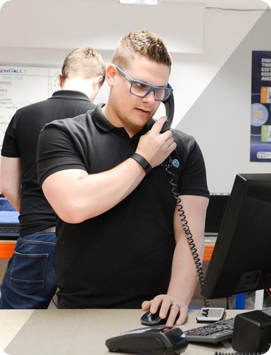 For managed WiFi services in Sussex and Surrey, call us on 01403 290 321 or 01293 912 321.